Well look here, what have I gone and done! 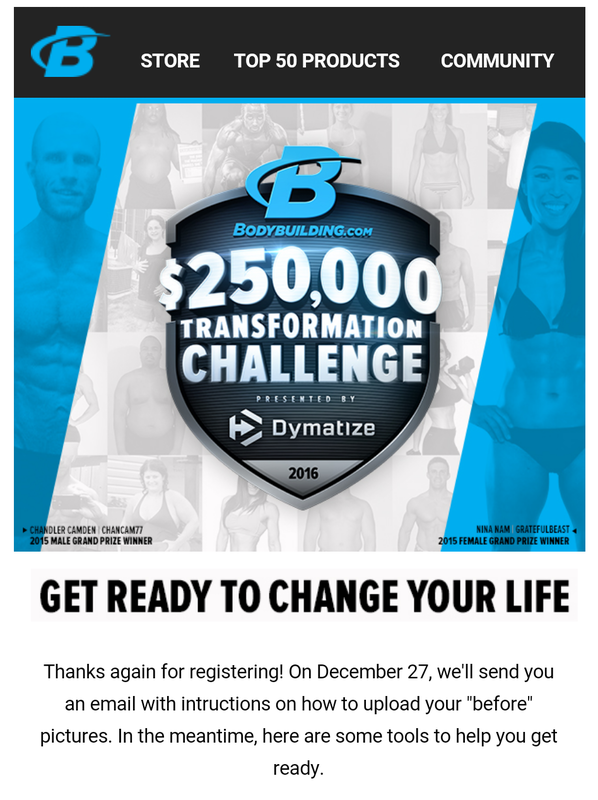 Binny has signed herself up for the 2016 Bodybuilding.com Transformation Challenge!! You can submit your before photos from Dec 27th until Jan 10th so as soon as that email comes through my photos will be going up. I registered last year too and did great for a few first weeks but had only really just started reading up on proper nutrition and such so struggled to plan and stick to plan. This year is going to be different. I’ve planned. And planned. And planned. I’ve ordered (and received!) all my protein powders, workout drinks, meal prep tubs etc. I’ve got my 12 week gym plan ready to go too! I am going to start on January 1st (yes..I’m one of THOSE people…) and plod on through until April 3rd. And that’s it. I’m not going to put any numbers on it (not right now anyway) as I’d like to just LOOK and FEEL better in my appearance rather than solely panic about a little (or not so little) number.